THE Quay Residents Association and residents of the Quay2 estate are gearing up to celebrate another year of their neighourhood home and street decoration competition. From November 24 to January 7, the neighbourhood will be decorated with colourful streetlamp banners decorated homes and streets, driveway cinema movies with holiday movies, a community Christmas tree and “Christmas Tree Lane” along Nautical Rise. Mark your holiday calendar for the Christmastime in The Quay event, to be held at Hilltop Pirate Park on December 15 from 6-8pm. Families will be able to meet Santa and his elves alongside a jumping castle. There will also be a photo booth, face painting, holiday glitter tattoos, crafts station, Christmas music, caroling, drumming and dancing, and Santa will be holding a children’s holiday dress-up contest. 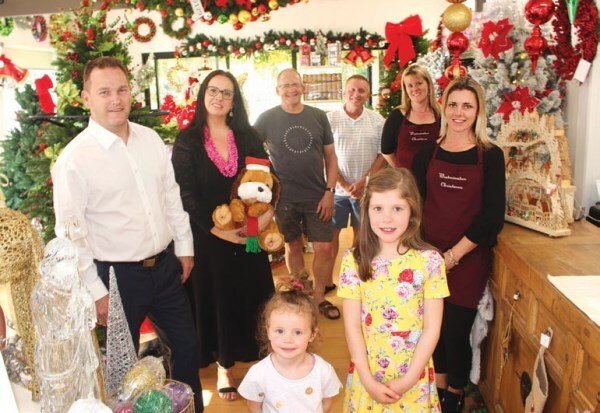 The winning residents’ nominated ACNC-approved not-for-profit charities will be jointly announced by The Quay Residents Association, shire mayor David Bell, councillors and donors. Invitations and entry forms will be delivered in early December. Representatives of some of this year’s charity donors to Christmastime in The Quay at Westminster Christmas earlier this week. Intrapac Property chief operating officer Maxwell Shifman said The Quay was renowned for its Christmas spirit. “The Quay is a very spirited neighbourhood to live in – where everyone knows each other and is considered extended family, and we are so fortunate to have wonderful local donors to sustain our Christmastime in the Quay for not-for-profit charities fundraising event,” Nick Kearsey of The Quay Residents Association said.